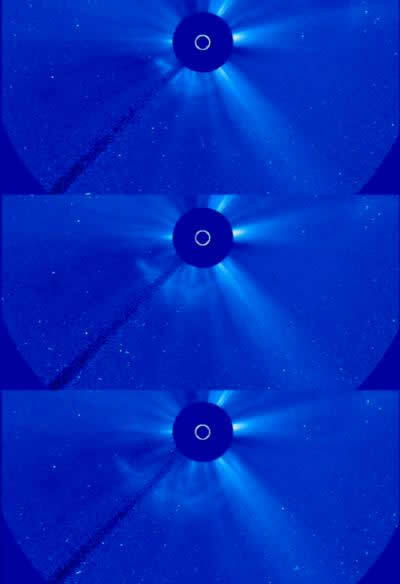 NASA/Goddard Space Flight Center-(ENEWSPF)- On Jan. 31, 2013 at 2:09am EST, the sun erupted with an Earth-directed coronal mass ejection or CME. Experimental NASA research models, based on observations from the Solar Terrestrial Relations Observatory (STEREO) and ESA/NASA’s Solar and Heliospheric Observatory, show that the CME left the sun at speeds of around 575 miles per second, which is a fairly typical speed for CMEs. Historically, CMEs at this speed are mild. Earth-directed CMEs can cause a space weather phenomenon called a geomagnetic storm, which occurs when they connect with the outside of the Earth’s magnetic envelope, the magnetosphere, for an extended period of time. In the past, CME’s such as this have caused auroras near the poles but didn’t disrupt electrical systems on Earth or interfere with GPS or satellite-based communications systems. NOAA’s Space Weather Prediction Center is the United States Government official source for space weather forecasts, alerts, watches and warnings.